Although we’ve seen a rise in the popularity of adult coloring books in the past few years, did you know they’ve been around since the early 1600s? For centuries, people of all ages have spent time doodling, painting, or even just drawing in the sand. Especially during uncertain times, the mind can wander to unpleasant thoughts, so giving it something to focus on – like art – can be beneficial. We think Ralph Waldo Emerson says it best. In one of his essays, he writes, “By descending down into the depths of the soul, and not primarily by a painful acquisition of many manual skills, the artist attains the power of awakening other souls.” For people who suffer with a condition that affects their memory, making art may provide peace, a brief escape, or a means of expression. Plus, art therapy for dementia patients can produce a variety of significant cognitive benefits. For decades, scientists have studied the effects of art on the mind. Luckily, there has been quite a bit of research behind art therapy for dementia. The German journal Fortschritte der Neurologie-Psychiatrie published a critical analysis of studies performed before 1998. All of these studies included groups of at least three participants and found that art therapy for dementia can improve patients’ interaction skills and help them accept dementia as their illness so that they can better cope with it. Art therapy can also enhance dementia patients’ cognitive abilities in the short term. This includes their verbal skills and attention spans. 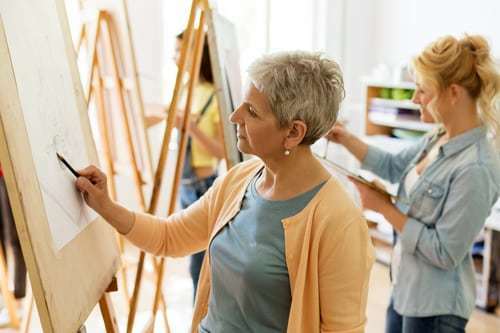 In one study, participants with dementia were given a 30-minute educational session about art appreciation in an art gallery and then participated in a 60-minute art creation session. During the sessions, the researchers encouraged the patients to have discussions. The results showed that the patients’ attention was enhanced, and their average verbal fluency increased from 7.3 percent to 25.9 percent after the art therapy session. Although more studies need to be completed to determine how art therapy provides relief for those suffering with dementia, these results are encouraging. Keep the project on an adult level. Avoid any activities that may seem too childlike or demeaning. Have a conversation while creating the art. Say encouraging words and talk about what you both are creating. You can even use this opportunity to try and reminisce together. Help your loved one start. For example, if the project requires the use of a paintbrush, you might have to help guide his or her hand. Avoid materials that could be harmful, like sharp tools or toxic paint. Don’t rush the project. Keep in mind that you two don’t have to finish it all at once. Art therapy isn’t the only creative activity that can benefit people with dementia. If someone isn’t interested in visual art, they could explore music, dance, poetry, or any other creative pursuit that interests them. If you’re looking for more tips on activities to help with dementia or have a loved one in need of care, contact the Crossings at Riverview. Our welcoming community provides peace of mind for families and their loved ones by offering assisted living, respite care, and memory care services. Tour our community, meet our friendly staff, and see our amenities first-hand. Our beautiful facility sits on 12 acres overlooking the Alafia River. That setting provides a relaxing atmosphere, and our talented team has a commitment to cultivating a welcoming and vibrant community. Our goal is to make our community feel like home for all of our residents. To schedule a tour, call 813-296-6165 or contact us online. We look forward to meeting you!